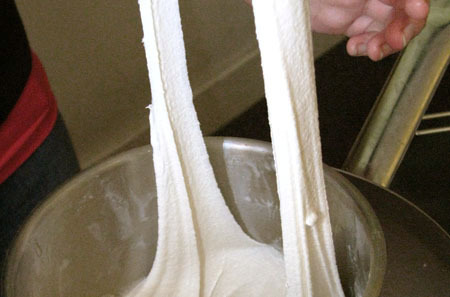 Science and tradition meet when chemists cook up stretchy Turkish ice cream. Stretchy ice cream in action: A chilled bowl of the stuff is stretched out during a demonstration. From the back of the chemistry lab comes the clanking of bowls, the beeping of a microwave and even the appreciative smacking of lips. In this back room, away from the usual laboratory paraphernalia, students from Kent Kirshenbaum’s lab and the food studies department at New York University are making ice cream. Milk and sugar are included, but because a chemistry lab is not your typical creamery, this is also not your typical ice cream. It is traditional Turkish ice cream, known as Maras dondurma. When prepared with the right ingredients and care, it becomes so elastic and pliable that Kirshenbaum says people have been photographed jumping rope with it. “It’s like pulling taffy,” he says. Kirshenbaum’s team is trying to understand what makes this traditional dessert so stretchy—whether it’s the unusual ingredients, the meticulous preparation or both. In addition to milk and sugar, it contains salep, which is ground orchid root, and often contains a flavoring called mastic, which is a dried resin harvested from trees on a tiny Greek island. The ice cream goes through a mostly human-powered process before it eventually becomes elastic. Click here to see the recipe for stretchy ice cream. The researchers are finding that the stretchiness depends on a combination of all these things, says Arielle Johnson, an undergraduate chemistry major who has been working on the ice cream as part of an independent study project. While mixing up different batches, she has been observing the consistency—and tasting a little here and there, of course. “Getting chem credit for cooking is pretty awesome,” Johnson says. The group also includes Richard Silver, a graduate student in Kirshenbaum’s lab, and Anne E. McBride, a graduate student in the food studies department. Kirshenbaum’s students typically study polymers, which are long molecules with repeating units (think: beaded necklaces). But polymers are not limited to labs. Polymers make cornstarch a good thickener and cause gelatin to gel. “A lot of what we do when we cook is to do biochemistry on polymers,” Kirshenbaum says. The two unusual Turkish ice cream ingredients, salep and mastic, probably contribute to the ice cream’s mysterious elasticity because they both contain polymers. The main polymers in salep are glucomannans, which are chains of sugar units, and in mastic there are poly-beta-myrcene polymers. Two Turkish researchers who have investigated the ice cream’s properties have not looked at mastic—it is not always included in the dessert because it is a flavoring ingredient. But one of the researchers, Sevim Kaya, who is in the food engineering department at the University of Gaziantep in Turkey, writes in an email that the ice cream’s consistency is probably based on both the salep and the traditional processing. Johnson, from Kirshenbaum’s lab, admits that you can make the ice cream without mastic, but she says that the dried resin gives it more stretchiness. And some Turkish ice creams are stretchier than others, says Kirshenbaum. Similarly, ice creams typically found here in the United States can have different consistencies depending on the amount of milk fat and protein, gums used as stabilizers, or other ingredients, says Karen Schmidt, a dairy science researcher at Kansas State University. Where can I get salep and mastic or some equivalent? I’ve been making ice cream–american-style–but this sounds crazy and interesting to make. Thats so cpool i think im going to try that and use it for my science project…..
To find konjac flour (instead of salep), try a health foods store or Japanese supermarket. Look for mastic at a store that sells products from Greece.